Augmented reality (AR) is one of the newest and fastest-developing areas in smartphone tech – and, no, it’s not just about pointing your phone’s camera at products in the supermarket to find out whether they're cheaper online. AR can be fun, and educational, too. It will let the little ones draw sculptures in 3D like a preschool Rodin, make Lego creations without you having to spend any money on sets, and learn about ancient Egypt. All you’ll need are either an iPhone of the 6S generation (2015) or newer, or a phone that runs Android 7.0 or newer. Got that sorted? Here are five AR apps you should try. Have you seen how expensive Lego sets are? Letting your kids loose on the AR alternative may only cement their love for these pricey colorful bricks, but it’s one way to stop them asking for a new real-life set right now. Lego has made a bunch of game-like apps that let you build creations brick-by-brick, and then bring them to life with animations and movement. BrickHeadz Builder AR is the most ambitious, as it transposes the process of making Lego creations onto the real world. This initially sounds incredibly fiddly, but your kids are eased into it, and it's a great demonstration of the fidelity of augmented reality hardware. If your children find it too tricky, you might want to install one of Lego’s non-AR apps. Lego Duplo Train is perfect for young children. Too simple? Juniors Create & Cruise is a little less simplistic, and Lego Creator Islands is another step up in the level of interaction. The traditionally tech-cautious BBC has already experimented with augmented reality, producing Civilisations AR. It turns your phone into a mini museum, letting you discover real-life exhibits by dropping them AR-style onto your kitchen table. Your kids can then explore them, using a virtual flashlight to highlight parts, and read more about them in the written guide. All of the exhibits are real-life objects, and Civilisations AR tells you the museum in which they're housed. Planning a visit to the British Museum during the school holidays or on a trip to the UK? Civilisations AR is a neat way to get them to engage before you even get there. This is probably an app only older children will enjoy, though, as while the text is easy to read, it hasn’t been watered down to suit a very young audience. Had enough of our educational picks? Crayola Color Blaster (it's Color Blast AR at the App Store) is pure silly fun. It’s an augmented reality game in which you blast zombies and dragons with paint, and have to move around your home to avoid them. This isn’t a violent game, so it's perfect for kids, but you do lose paint bucket 'lives' if the waves of enemies catch up with you. There’s a story mode that teases the most entertainment out of a simple AR action style, and an arcade mode that does the trick for a quick five-minute splatter-fest. Both of these modes are free to play in Crayola Color Blaster. The star map was one of the original uses for augmented reality. Google released its Sky Map astronomy chart in 2007, and a phone app version appeared not long after Android was born. You can still download and try that app on an Android phone – it’s called Sky Map. However, there are now much more advanced and visually appealing takes on the same idea, and Star Walk 2 is one of the best. Point your phone at the sky and you can use it to identify constellations, and zoom in to see information on planets and star clusters. The amount of information packed into Star Walk 2 when you dig a little deeper is sensational. The only issue is that the app is a little heavy-handed with ads; however the ad-free version is well worth the $2.99 (£2.99, AU$4.49) price if it sparks your kids’ imaginations. This is an official Google AR app, and it’s brilliant. On paper, Just a Line sounds almost too simplistic: it lets you draw in AR, with a white line of one of three thicknesses. There’s no color, and no textures or brush styles. However, in practice it’s spellbinding. Just a Line doesn’t feel like drawing – it’s closer to creating a sculpture in 3D space, or virtual 3D printing, with the movement of your phone teasing out the line in all directions rather than just on a flat plane. You can then pan around your creation in seamless 3D. 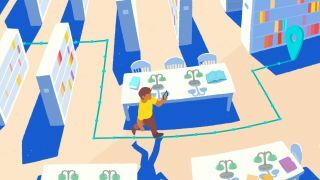 Just a Line even lets you draw with another person in the same 3D environment, using another phone or tablet that supports ARCore, Google’s augmented reality standard. You can also record a video of your painting sculpture in action. This is most definitely not 'just a line'.